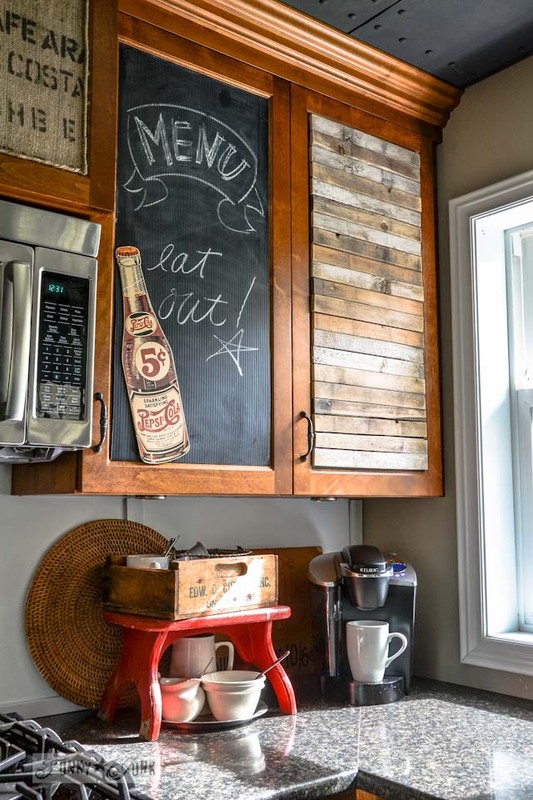 Junkers Unite with junky kitchen cabinets, a pin board and link party! Greetings junkers! I have a little surprise for you today! A united group of a few of my favourite junkers and I have created a fun event, sharing brand new junk inspired projects and more! Wait till you see what we’ve been up to! 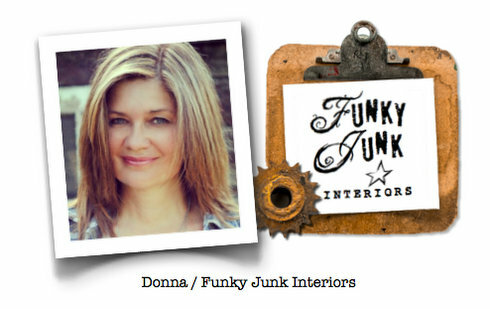 In case you’re new here, I’m Donna, author of Funky Junk Interiors and my feature blog, I Love That Junk. My deal is collecting the stuff that no one wants and morphing them into must haves for my home. You can check out all the rest of my projects HERE. And you can follow along my crazy junk story via Facebook, Pinterest, Twitter, Instagram and Hometalk. So ready for some new junk?! Let’s get started! I have a lovely, newish woodsy, warm rustic kitchen. 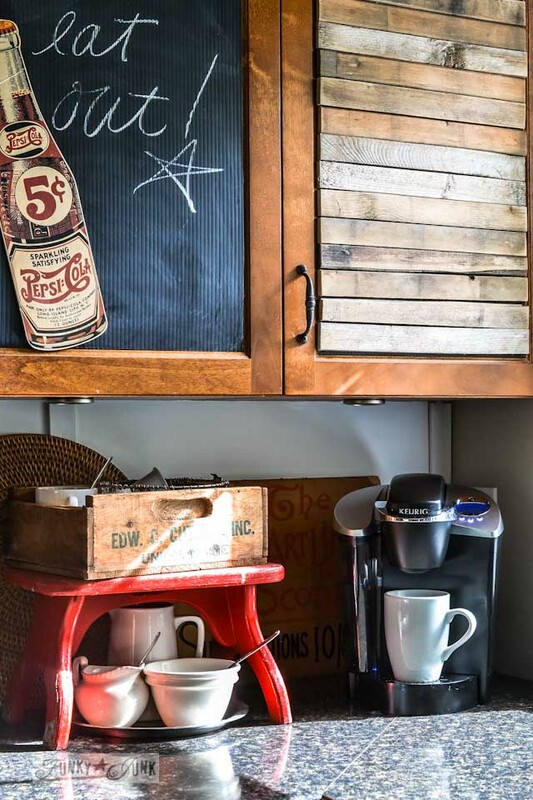 While I adored my metal topped kitchen island, I didn’t feel the cupboards were a true reflection of my junkin’ ways as is. I debated on painting them, or maybe just the uppers, but I wanted to try something I hadn’t seen done before first. Sadly, my entire batch of tutorial shots slipped away along with my failed hard drive, but this tutorial is so easy this one picture will do it! 1. 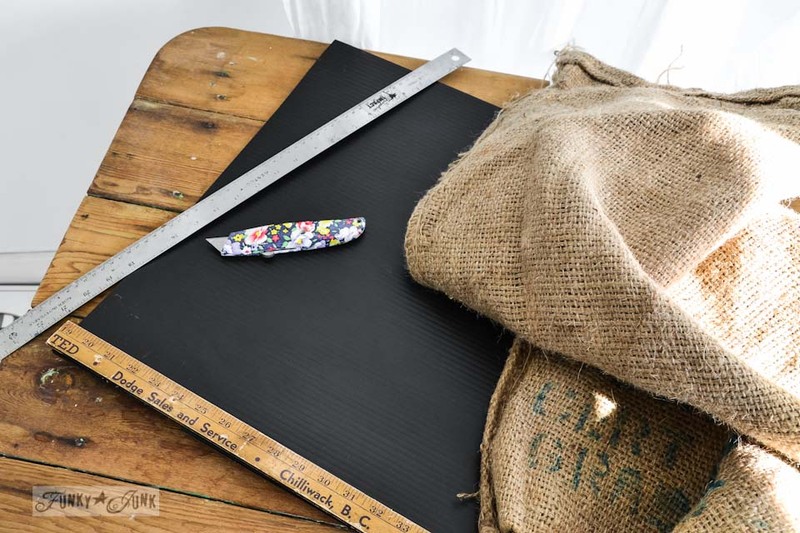 Cut a piece of coroplast to the size desired, with a ruler and exacto knife. 2. Hot glue your desired treatments onto the coroplast. 3. Use 2 sided carpet tape to attach the coroplast to the doors. The coroplast chalkboards were abit of a fluke. I was going to cover them with something when I fell in love with them just the way they are! I may replace the panels with something smoother at some point, but I don’t mind the ripples for extra texture. Chalk works great on the plastic! 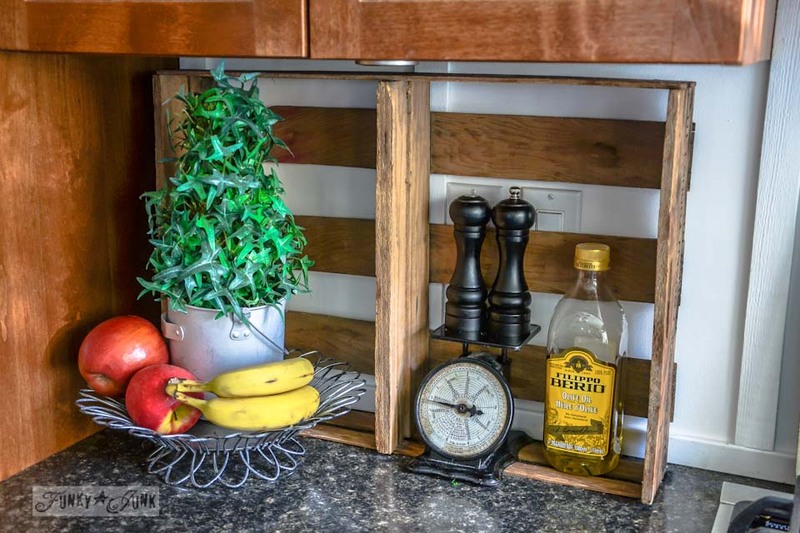 Chiming in with all things old, a crate fits snugly in this under the counter space, offering a woodsy visual without darkening the backdrop completely. 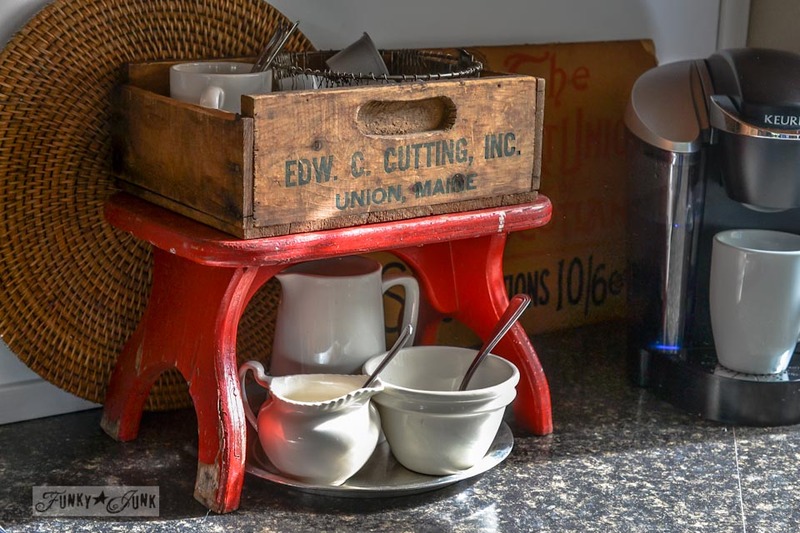 The little red bench coffee station is the perfect size AND punch of rustic colourful charm for this small space! 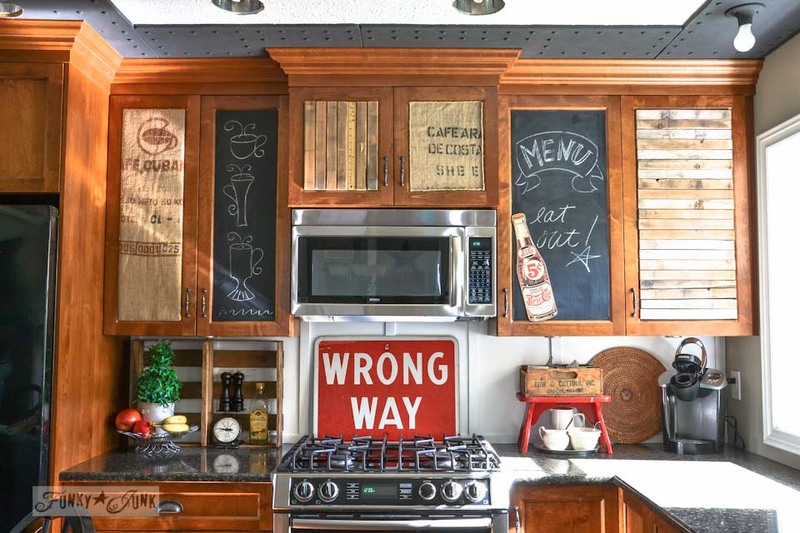 The nice thing about this design is, the panels are not permanent, so this is a great way to change things out as desired, or a great fix for renters! To me, the kitchen now wears a funky coffee shop vibe which I love. Coffee anyone? As a side note since nearly everyone asks, the ceiling black panels are MDF cut to look like metal panels. They hide a damaged ceiling which transpired after the old cabinet headers were removed. You can read more about it in The Kitchen Renovation Series – Part 3 HERE. 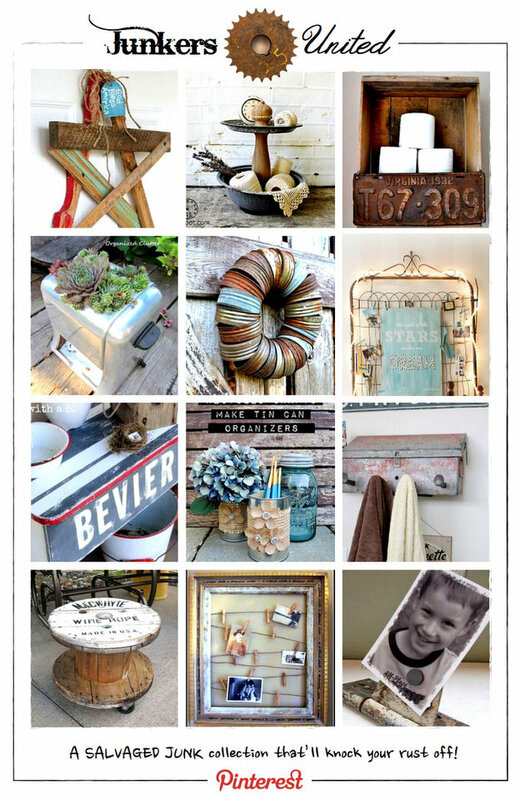 The Junkers United team have also been pinning like MAD, capturing the best junk on the net into one pin board! If you love your junk, you will love this! Click below to visit new junk projects by all! And the best part of all? 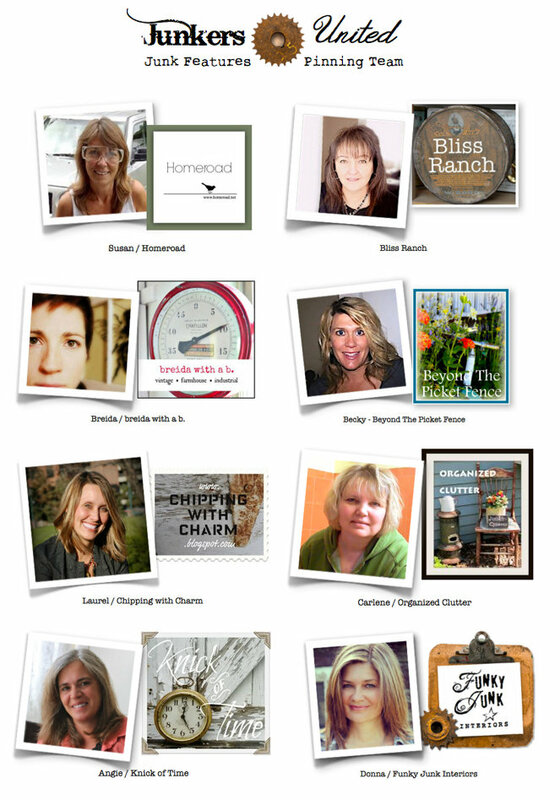 All of these junk bloggers have a brand new junk project they’ve also whipped up on their own blogs! Visit each one by clicking the below links! Thanks for visiting! Happy Junk visiting to ya! Donna, what a difference!!! Your kitchen looks like a restaurant, so COOL!!!! I LOVE the black tiles on the ceiling. You’re right, they’re perfect left black (gives me ideas for that metal sheet – thank you). Question, when can I move in? love the menu. eat out that is my kind of menu. Those cabinets have so much personality, perfect fit at Funky Junk. The fact it can be changed up makes them something people can do without committing to it forever. I’m looking at my own cabinets to see how I can use these ideas. I love, love this idea–so great for a quick change up and the possibilities are endless! Your “new” kitchen suits your style perfectly! Great work. Wow, interesting ! the imagination has no limit and you have an eye for design ! I like the idea of giving another life to things. The only question in my mind is how do you clean those things perfectly and then put them on your kitchen counter ? How were those things used before and in what conditions ? Maybe we don’t want to know !!! Love it! What are the wood strips from? They look to be just cedar strips Carol, they were aged and loose when I found them bundled up together at a thrift store of all things! love, love love it. What is the black metal looking stuff that is on the ceiling? Love that too. okay! Now you’ve done it! I am always lamenting because I rent right now and can’t change too much about my house. But, oh my goodness if I couldn’t do this with coroplast! I work for a sign shop so I have coro at my fingertips for pete’s sake! you are BRILLIANT and you may have just changed my whole outlook on my house! Thank you so much for sharing your amazing ideas! Be still my heart!! Love this! I love how they turned out. What a cool junky way of adding your own personal touch without a lot of cost or time. I will have to keep this in mind, for when I am tired of my kitchen. Every time I convince myself to paint my kitchen cabinets, you post another version of your fabulous kitchen and I waver!!!!! lol LOVE your cabinets and they look even better with the wood and black inserts. I so wish my kitchen wasn’t so dark. Thanks for the party! 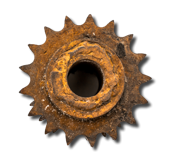 My husband has declared that I’m no longer allowed to bring any more rusty old junk into our house unless I get some of the OLD rusty old junk out. I would love to unite with you guys on some pinning projects! What an excellent team you have assembled! Linking up now. Your kitchen cabinets are beyond great! Thanks for everything! Love love love the character that you added to the kitchen. Fabulous and creative! Such great inspiration. The cabinet doors look amazing! I absolutely love the character that you gave them. Donna, it looks amazing! You never cease to surprise me with your creativity and the way it turns out like it was planned the whole time! I love that about you! Where does one buy corrugated plastic? What a fantastic idea!! Thank you for sharing it – your kitchen looks cozy AND funky! 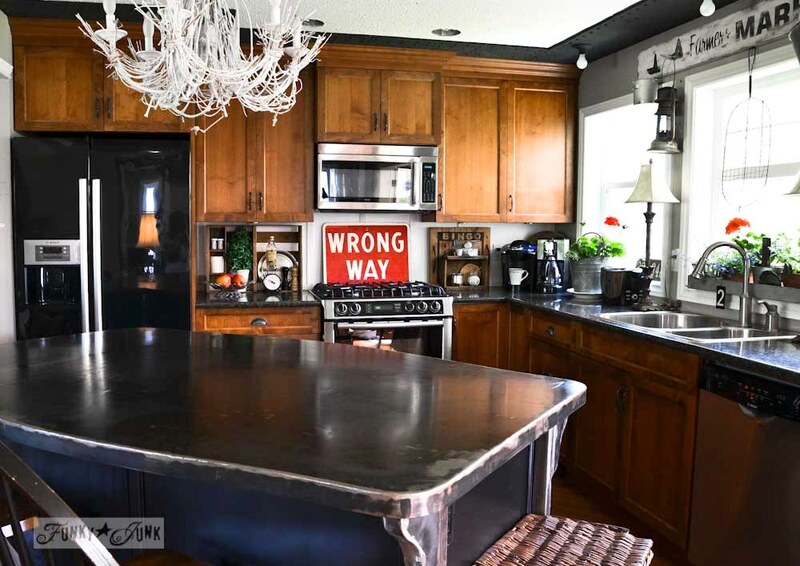 I LOVE the metal countertop on the island, too! Could you share where the corrugated plastic is purchased? I’m thinking it can be found at Staples or Office Max for making signs? Thanks so much! Love it Donna! Such fun funky junk style. Love your imagination! Thanks for the fun party. Shout out to Union, Maine…I have quite a collection of old wooden boxes, my favorite is one for dynamite! 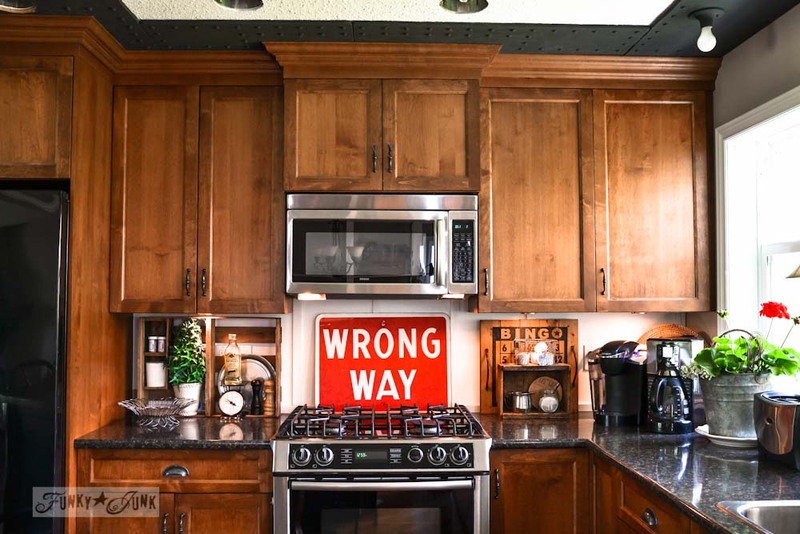 Had to comment on your “Wrong Way” sign propped over the stove. It made me smile and wonder, does it discourage you as a cook, at all, ever? Love your style, I think we were separated at birth because our tastes are so, so similar. You have more drive/ambition/follow through than I do. I have always appreciated your words of encouragement to follow your passion. Do you think a blood transfusion from you would help? I think you did a fantastic job. I love the look, great coffee shop vibe. Hi Donna, I just love the cabinets especially the coroplast. Where does one buy it at. Such a cool idea! Oh Donna! You are so creative! You always surprise us with your gorgeous ideas. I really love your new cabinets, congratulations!!! Wow love your kitchen. Your cabinets looks so great! It’s really nice to see something other than white. Fabulous. 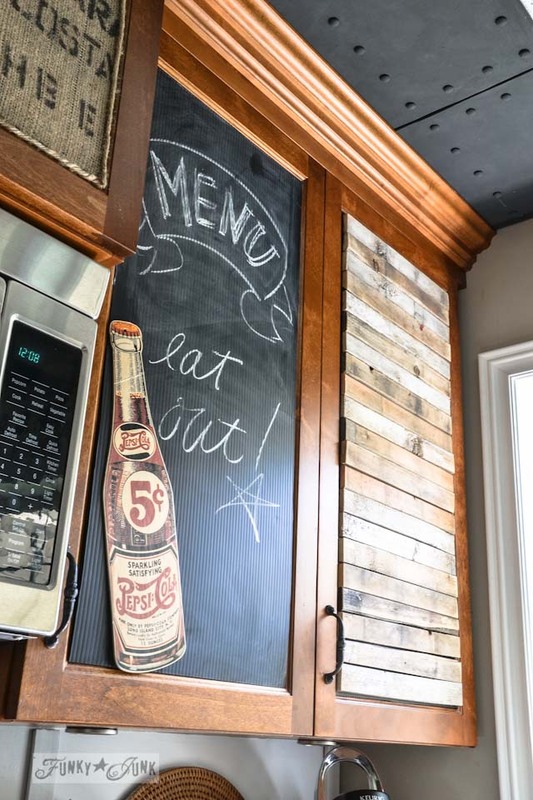 Absolutely LOVE these cabinets… and everything else your hands touch for crying out loud!! I was wondering about the 2 sided carpet tape. That stuff wouldn’t rip off the finish of the cabinet when I take it off would it? I am a renter and wouldn’t want to damage anything… at least not accidentally, lol!! Hey Carrie! No issues here whatsoever. I’ve removed the tape to see what it did and all is perfect. But with everything, perhaps do a test run in an area that doesn’t show much. This is amazing! My husband and I bought out first house this year- a new construction. I am always trying to find ways to add character, but we are so afraid of making things permanent because we are afraid we will screw up! This is too perfect! Thanks so much for sharing your idea with us! I love this. But how much damage will the tape do to the finish on the cabinets? My husband loves this and is willing to do this but not if it damages the finish. Is there something else you can suggest we use?